Click the button below to add the Tensioning Hook for RUD Grip 4x4 Tire Chains (Sold in Pairs) to your wish list. Delivery anywhere within the contiguous 48 States is generally within 2 to 4 days of your order. *Note that a purchase of one means you will receive 1 pair of tensioning hooks. A quantity of two means two pairs. Etc. The simplicity and quick installation of the RUD Grip 4x4 Tire Chains is in large part due to its design that includes a tensioning chain with tensioning hook. It is important to regularly check the tensioning hook for any cuts or other damage that may snap the hook and compromise the tension of the chains on your truck's tires. If you do encounter damage to your tensioning hook, it helps to have a spare available to replace the damaged hook with a new one. This helps prevent your tire chains from coming loose while driving with your chains on, an event which could potentially cause great damage to important and expensive parts on the underside of your truck. Our normal price for one tensioning hook with shipping included is $12.55. Thesee hooks are sold in pairs (1 hook as backup for each of your two chains). This is why we sell them in pairs and offer you a bulk purchase discount for it. Your actual pricing will be apparent at checkout once you've selected the quantity of pairs and then added to cart. 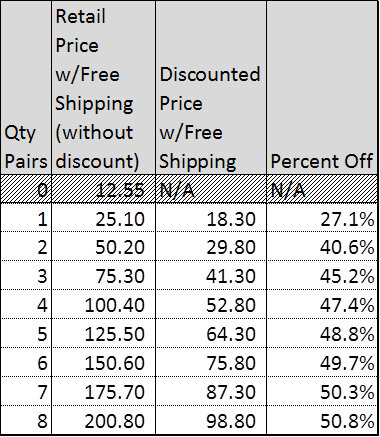 In the pricing chart below, the quantities are of pairs of hooks. Qty 2 = 1 pair, Qty 4 = 2 pairs, Qty 6 = 3 pairs, etc.